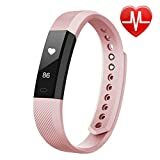 Various Features: Pedometer, Distance, Calories Burned, Heart Rate Monitor, Sleep Monitor, SMS Reminding, Call Reminder, Incoming Call ID Show, SNS notifications, Camera Remote Control, Sedentary Reminder, Find Your Phone, Anti-lost, Sports target remind. Ultra-slim deign with 0.86 inch OLED Screen Display, mini vibration alerts motor, See call notifications, daily stats and time of day. With built-in USB plug, simply insert it into USB port of computer or portable power bank, etc. IP67 waterproof washing your hands, getting caught in the rain will not damage your fitness tracker watch. Compatible with iOS 7.1 or above & Android 4.4 or above, and Bluetooth 4.0 (Smartphone only, not for PC, iPad or tablet). APP “Veryfit for heart rate” Charge about 1-2hrs, 5-7 days standby time. Bluetooth 4.0. Battery: 45mAh Li-polymer. Strap: 240x16x10mm. Weight: 18g. Monitor your Heart Rate all day long with this slim, stylish device. This smart bracelet can automatically recognizes and records exercises for you, so you can keep track of your workouts. At night, it tracks your sleep cycle, helps you learn how to sleep better, and wakes you silently in the morning. The bright OLED display helps you stay connected with call, text and calendar alerts, stay active with Reminders to Move. Built-in USB plug, easy to charge with any USB block and computer, no charging cable and dock needed. Plus, you can find a look that fits your style with the interchangeable bands. This will become your perfect companion, it will be with you everywhere you go and it looks good no matter what you’re wearing! Find Phone:Get notified when the smart band is getting out of range from your phone. SMS Alert:Turn this on to read incoming text message right on your smart band screen.